﻿Hispanic Heritage Day: Calendar, History, Tweets, Facts, Quotes & Activities. 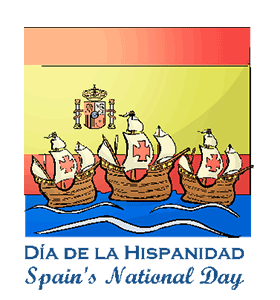 Spain’s National Day celebrates Christopher Columbus’ arrival to the Americas on 12 October 1492. King Ferdinand of Spain sponsored the expedition west in the hopes of sailing to India. In August of 1492, Columbus set off into the Atlantic; two months later he would set foot on the Bahamas, establish settlements on Hispaniola Island and spread Christianity to the New World. Upon his return to Spain, he spoke of gold and riches and thus the Americas were opened up for European colonisation. Spain’s National Day is celebrated on 12 October, as it is in many former Spanish colonies, marking the day that Christopher Columbus first set foot in the Americas. Christopher Columbus was a highly religious man. He had a deeply held belief in God and he would regularly name lands he discovered after religious names. Christopher Columbus was actually born in Italy, despite the fact he discovered the America’s while he was sailing on an expedition sponsored by King Ferdinand of Spain. Christopher Columbus’ voyages to three separate continents spread deadly diseases that did not exist there at the time. It is estimated that he and his crew were responsible for killing some 3-5 million people within 50 years of his arrival on three continents. Columbus set off in August of 1492 with three ships, the Nina, the Pinta and the Santa Maria. Patriotism is when love of your own people comes first. – Charles de Gaulle, French military general and the leader of Free France. Attain Spain’s Armed Forces Parade through the city of Madrid. It includes over 3000 soldiers and military vehicles and there is usually a fly by where the planes leave red and yellow smoke trails to symbolise the Spanish flag. Many government official and dignitaries attend and participate in the event. Watch a documentary about the pre-colonial times and the diseases and devastation brought by Spanish colonials to the New World. Some of our suggestions: Guns, Germs and Steel , America Before Columbus and Mesoamerica . Visit the Plaza de Colón, which is located in Madrid, Spain. The plaza and its fountain commemorate Christopher Columbus and his voyage to the Americas. Typically there are celebrations held during Spain’s National Day here. Read a book about Christopher Columbus and his voyage to the Americas. Some of our favourites are: The Four Voyages of Christopher Columbus , The Log of Christopher Columbus and The Journal of Christopher Columbus . Spread awareness on social media by using the hashtags #SpainNationalDay, #FiestaNacionaldeEspaña and #ColumbusinAmerica.